t*rexes and tiaras: Friday Favourites 139..
Oh, this week the weather, combined with the arrival of pretty summer clothes arriving in just about every direction I look, are making the spending ban difficult. I've narrowed it down to the two items which are most tempting me. 001: I'm absolutely loving the new dinosaur range at The Whitepepper. Whilst I'm still not convinced that my dumpy shape is right for their signature smock dress shapes, I can't think of much better for a lazy spring weekend than this wonderful jumpsuit. 002: This is one of my favourite spots for a long time. As usual, it was something I spotted on Sarah's weekly wishlist post. I have found that I've not been browsing as many sites lately, but seeing the things which others are liking often tempts me into a little browse. 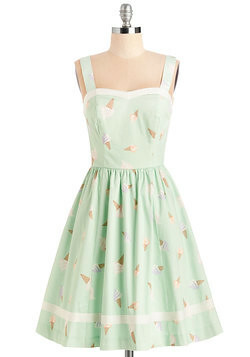 I love the pale mint colour of this dress and it's cute ice cream print, which I think would be just perfect for sunny picnics. Has anything caught your eye this week? Has the sunny weather made you think about adding to your summer wardrobe? I think I need to do this, as well. It would be like having new things, but without breaking the ban. I thought all that dino range was so cute! Gorgeous dress too. It's lovely, but I'd prefer a really girly, fitted dress.